Over the centuries Venetian lifestyle has been stigmatized as hedonistic and unethical. For strangers, especially carnival and the fact that so many citizens wore masks gave reason for suspicion. Someone who wears a mask has something to hide, they thought, and what else would a person want to hide than something felonious or unethical? Of course there’s truth in this explanation. Just visit Cologne in Germany today when the carnival season arrives, and you will certainly find out that this kind of feast is an event to do things you would not do at other times. But Belloni’s explanation of why masks were worn in daily Venetian life may be at least partly wrong. After reading Karbe and Toscani, I think especially the use of the Bauta had a more serious and sophisticated social and political background. The Venetians had a deep understanding of what anonymity was good for. And, what’s most important, a citizen wearing a mask in Venice did not escape law and order. Of course he or she could do things which were not meant to be attributed to him or her by others, but his or her behavior still had to comply with certain expectations and laws. 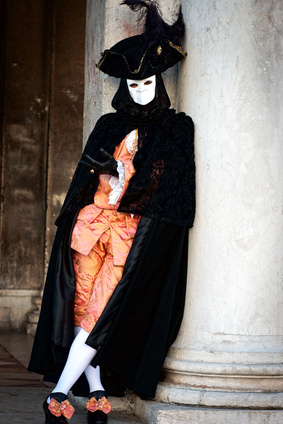 Venetians wearing Bauta and Volto were not up to antisocial behavior. Today, for older generations the internet life of the digital natives perhaps looks as suspicious as the Venetian life may have looked like from the perspective of other cultures in the past. Ironically, even piracy in a different context is a core topic again. But in both cases the critics also misunderstand a culture which knows about the merits of anonymity and how to live with it. That’s one of the topics I’d like to work on.